Bye bye Scotland, could the UK's nuclear arsenal be stored at Irish loughs? If Scotland turfs them out, that’s exactly what the DUP wants. 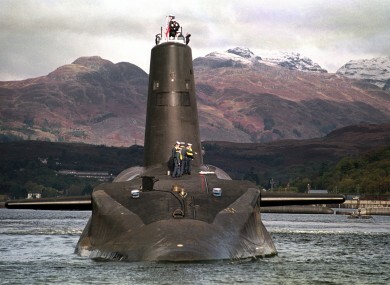 One of the UK's Trident-class nuclear subs. DUP MP JEFFREY Donaldson has raised the possibility of UK nuclear missiles being kept at Irish ports if the SNP succeeds in its bid to get them out of Scotland. Donaldson was speaking during a House of Commons debate after an SNP member who said that most Scottish MPs want the Trident missiles out of Scotland. Britan’s nuclear arsenal currently consists of the Trident programme which sees four submarines capable of carrying the warheads, with one on patrol out at sea at all times. The submarines are based at the Clyde Naval Base at Faslane in Scotland but their presence there is strongly opposed by the SNP. DUP's Jeffrey Donaldson tells Cameron Northern Ireland has 'lots of ports, lots of loughs' if Scots dump Trident + needs new home. Donaldson therefore says that the DUP would be “right behind” the missiles being deployed to Northern Ireland instead of Scotland. One of the sites suggested for the Trident missiles is Lough Foyle, a port which sits on the border between Derry and Donegal. “Lough Foyle was a naval base and during the Second World War and it played an enormous role in thwarting the German submarine U-Boat fleet in North Atlantic,” Donaldson said. One of the reasons Trident is based in Scotland is because of easy access to the shipping lanes of the North Atlantic, Northern Ireland would also provide access, whereas England and Wales less so. But Donaldson’s comments have drawn criticism from the Green Party here who say he’s made a “reckless offer” that he should withdraw. Louth Cllr. Mark Dearey says that Scottish MPs have consistently complained about poor safety standards at submarine basis and that this isn’t something we should want in Ireland. “Given that his fellow MPs in the SNP who have direct experience of the Trident presence are deeply worried, it would serve Mr. Donaldson well to reflect before making offers without any public discussion or consultation in Northern Ireland or in the Assemble,” said Deary. “As a councillor who represents the coastal community on Carlingford Lough, I would also like to hear Mr Donaldson clarify if it is one of the loughs he has in mind,” he added. Email “Bye bye Scotland, could the UK's nuclear arsenal be stored at Irish loughs?”. Feedback on “Bye bye Scotland, could the UK's nuclear arsenal be stored at Irish loughs?”.